The new 2018 Mercedes A-Class, which is finally coming to America, is getting nice-ified with things like an upgraded suspension, according to Autocar. More importantly, it will also be available in two performance models, the AMG A35 and the AMGA 45. And while it’s not totally clear if those models are are also coming to the U.S., I’m hoping so. We expect the A-Class will eventually replace the CLA sedan in the U.S. lineup, though that hasn’t been confirmed. And the AMG CLA45 has an absurd 2.0-liter turbo four with 375 horsepower, so we can hope the fast A-Class does something fun too. While the interior is already looking pretty fly, Autocar reports that buyers will also have their choice between two different suspension sets. A few other things that will be better in the 2018? Visibility, for one, thanks to thinner pillars. Mercedes also tweaked the steering. Details on the performance models were much thinner, though Autocar says that Mercedes will produce five gas variants and four diesel variants, in addition to the performance models. The A-Class coming to the U.S. will be a sedan—a first for the entry level series sold for two decades in other markets. 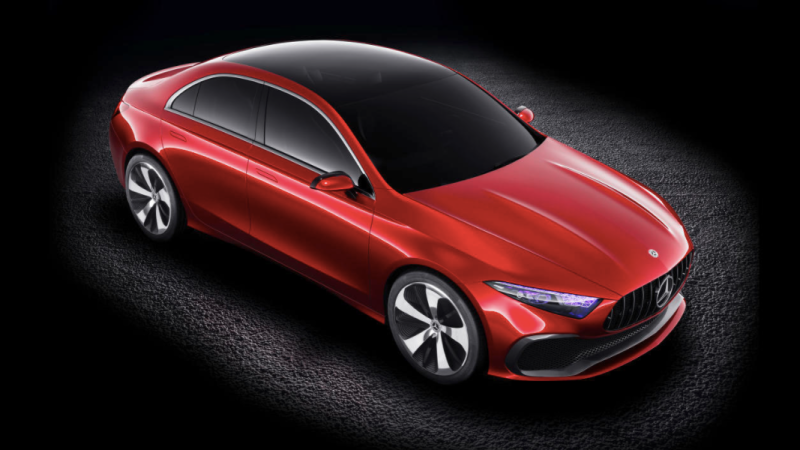 Asked about whether the performance versions would also come, a Mercedes spokesman said, simply, that it was “too early to provide any details.” I can only dream for now.